Last night, I had a date night with Brian! We would love to have a date night once a week, but are lucky it if happens once a month. Last week, Brian had to go out of town for work for a couple of days. Over the weekend, in addition to the regular craziness, we had a wedding reception, a baptism and an open house to attend. We really needed an evening alone, so that we could catch up and relax together. Our date nights are usually pretty casual. It is more about having time alone, away from the kids, than it is about doing something showy. 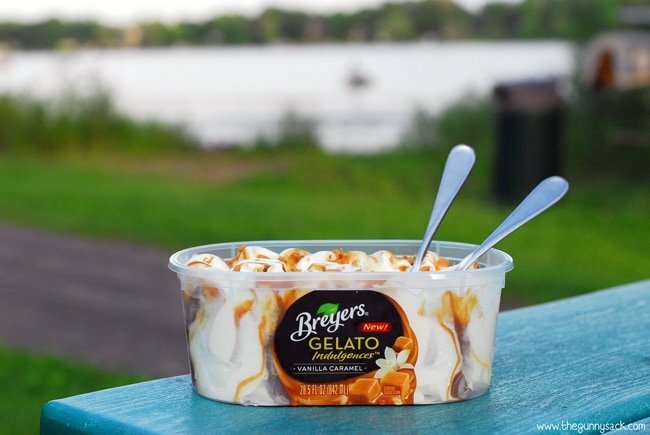 So, after making dinner for the kids, we enjoyed a quiet evening by the lake with Breyers Gelato Indulgences as dessert. 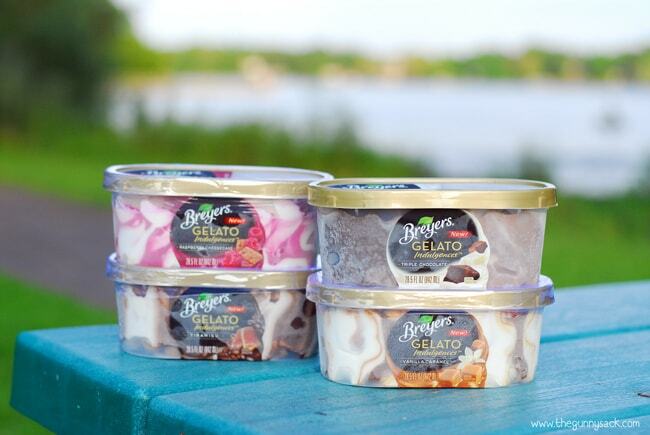 Before heading to the lake, we stopped by the grocery store and picked up all 4 flavors of Breyers Gelato Indulgences. I planned ahead and brought spoons and a cooler with ice packs to keep the gelato cold. We found a picnic table by the lake where we could sit and eat while watching the water. 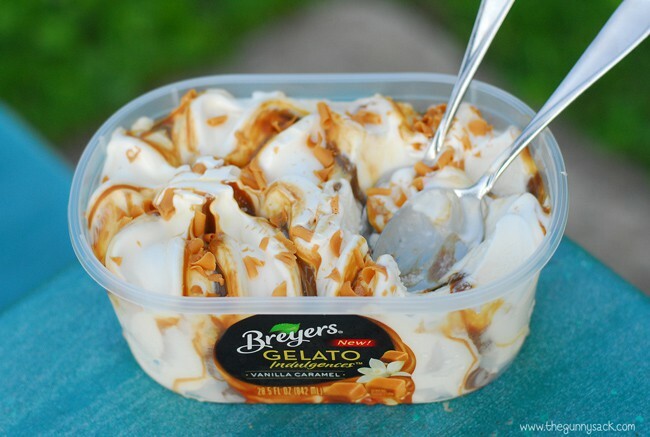 We started with the Breyers Gelato Indulgences Vanilla Caramel. Can I just say…AMAZING! The vanilla gelato is so smooth and the caramel sauce is delicious! This was our favorite flavor. Next up was the raspberry cheesecake gelato. 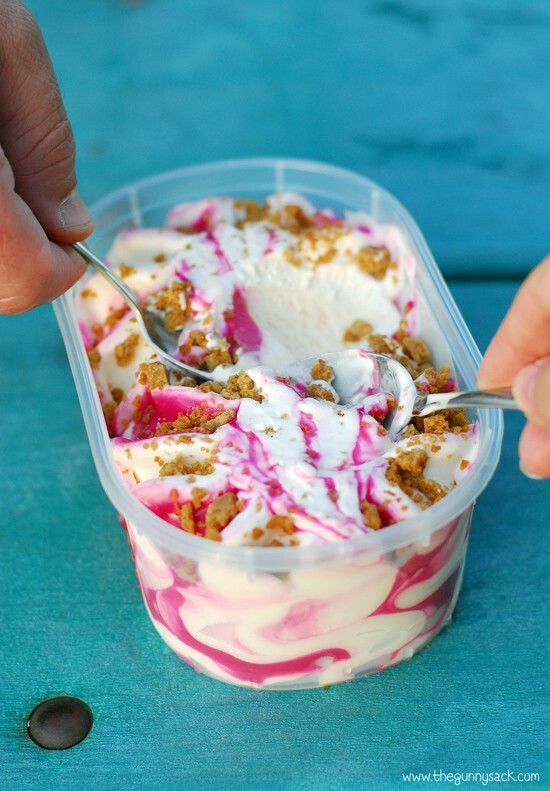 It was a wonderful combination of raspberry, cheesecake and graham crumbles. Then, we tried the tiramisu. We immediately noticed the espresso flavor and loved it! I wish I would've had a cup of coffee to drink while enjoying this gelato. Finally, we sampled the triple chocolate. Anything with triple the chocolate is bound to be delicious! 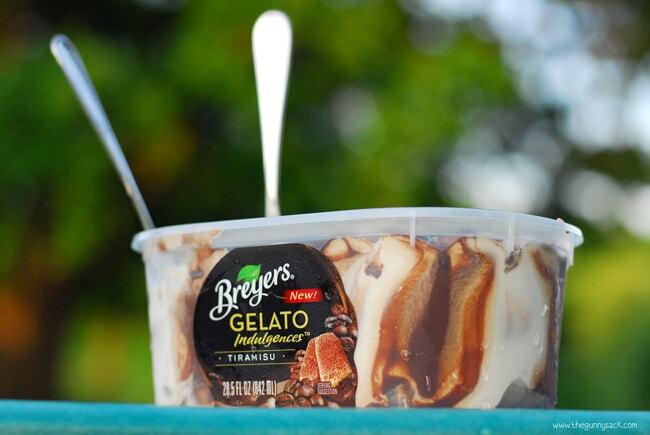 This gelato has white chocolate, dark chocolate and milk chocolate…oh yeah! 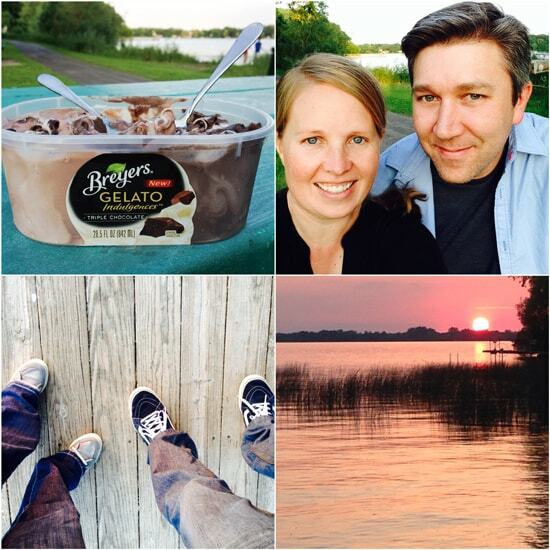 We really enjoyed our much-needed date night complete with laughter, gelato and a beautiful sunset. 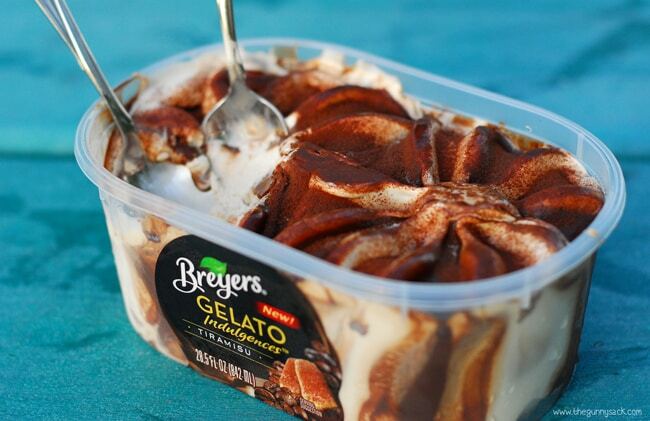 Of course, we are delighted that we had plenty of leftover Breyers Gelato Indulgences to put in our freezer. It is perfect for a stay-at-home date night after the kids go to bed. We can make cups of coffee and sit out on the porch enjoying a cool summer evening while eating more of the fabulous gelato! 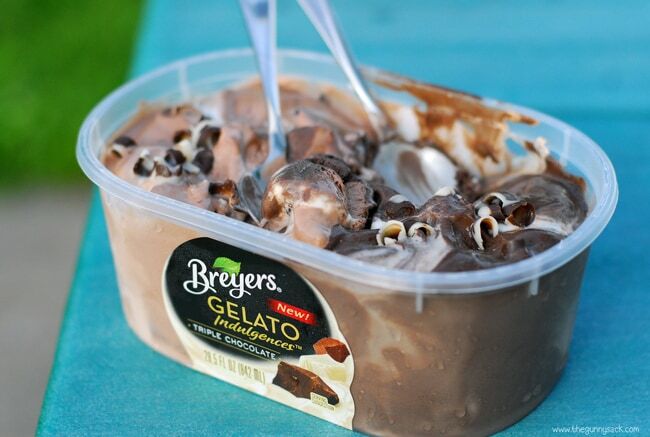 What flavor of Breyers Gelato Indulgences do you want to try and how would you incorporate it into your date night? They all sound great, but I’d start with the caramel one. 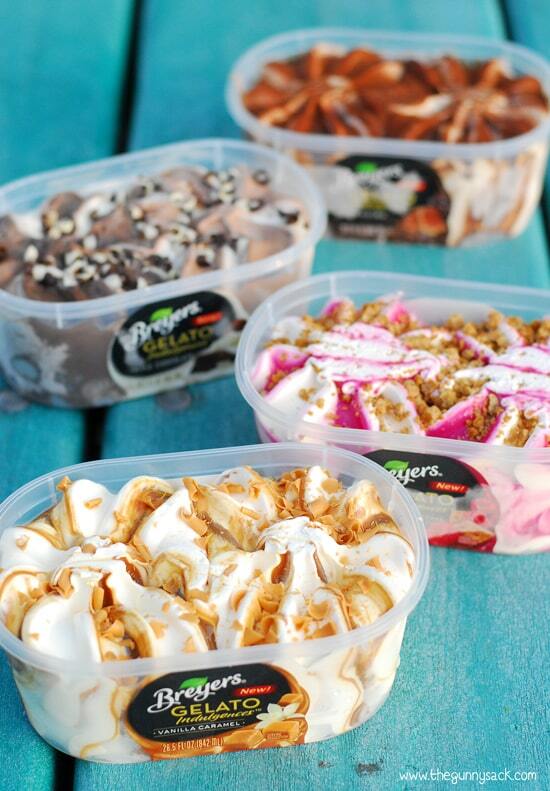 We love gelato. I had no idea that Breyers made it. I’m going to have to look for it!